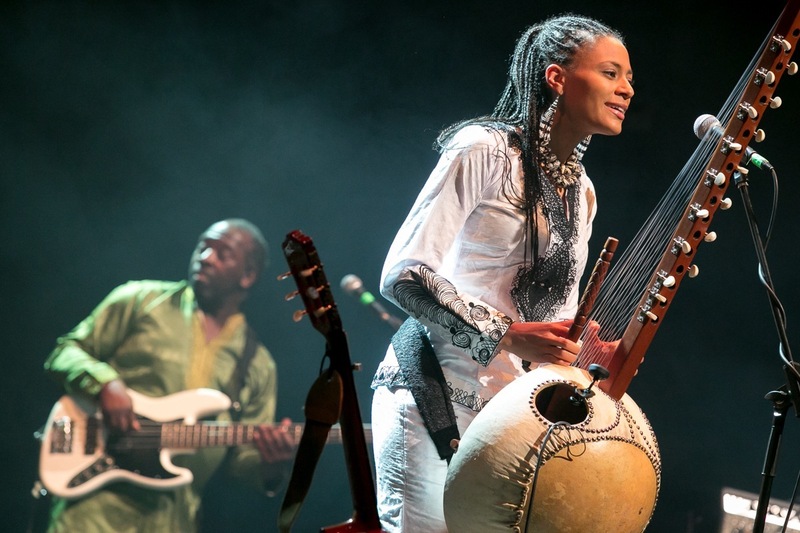 In spite of the many successes registered by the Kora Queen this summer, one of the greatest projects she accomplished in this 2015 tour cycle was in Poland. As artistic director and curator for the Brave Festival, the celebrated musician diligently and successfully delivered a mouthwatering event that left the organisers and music experts lip-smacking. It was hard not to be impressed by her effective planning, coordination, and arrangement of the activities of the festival. All these, coupled with her performances including the duet with her father, were what made her headline a festival of this quality. The Brave Festival takes place every year in Poland. This well-established festival (which took place from the 10th-17th July) had this year dedicated its theme to that of the griot, and music from West Africa. As overseer, the Gambian-UK singer made a careful selection of artistes from various countries who represented diverse aspects of the tradition. The singer, aided by her indefatigable band members, opened the festival with a spectacular night performance to a theatre audience of 700. “This was one of my greatest projects this year. My night performance, opening the festival was an amazing experience. I performed with my full band and it was a brilliant show”, she says. What was iconic for her with that show was the fact that they finished filming the much anticipated culturally and traditionally-inspired “The Gambia” music video during the performance. 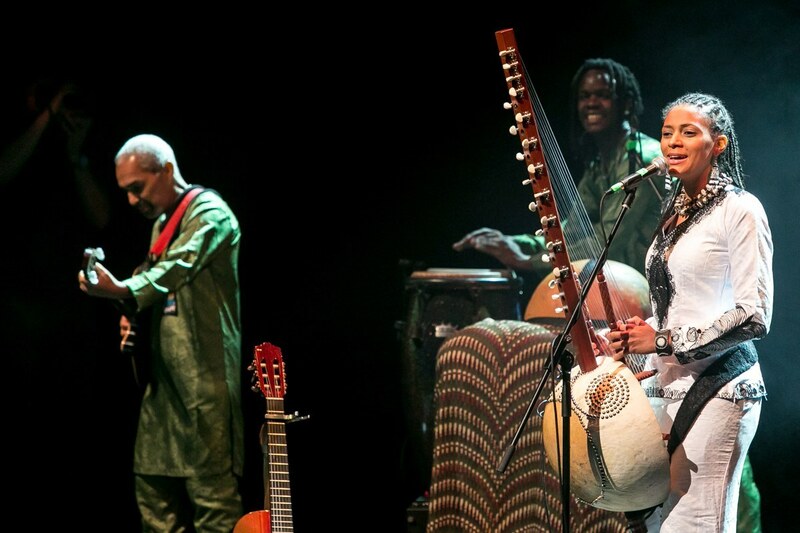 The idea was to capture some footages of the live performance of The Gambia song on foreign soil for foreign audiences. “I was actually struck how well we were able to mobilise them sing along with us; it came very well. We had the whole theatre up on their feet echoing the movements of the dance we got in the village of Kembujeh village in The Gambia. It was actually breathtaking and they were just singing so loud. I had told the audience before that I was going to finish this official video at the Brave Festival and they were so amazed that we actually chose that festival to finish the video. So we had five cameramen around the stage, at the sides and at the back catching that wonderful show. So we got some amazing footages to go into this video,” she says. Sona considers her role as curator of the festival as a profound honour and a giant leap forward that can only add greater value to her already internationally recognised artistic status. After her nomination by the director of the festival, she was handed the responsibility of, among other things, choosing and innovating the whole festival; who came? what artiste came on board? how they would fit together in terms of the story line of the festival. “I had been working on it for the past six months and seeing it came to fruition during the festival was amazing. I chose some of my favourite artistes, not just favourite but artistes I felt best represent some of the key areas of the griot tradition. This is because this year’s festival was dedicated to the griots. So I was trying to map out the history of the griot tradition through artiste performing. So I had Abou Diarra – Malian – from France come over to perform. I had Kasamadi, Lansana Kuyateh, Bala K. Sissoho, Bala Kuyateh, one of the leading balafong players in Mali and so on. So basically I was presenting the whole festival,” she says. It was Sona’s exclusive role to make a presentation about every artiste that was performing; why she had chosen them as well as explaining their relevance in the tradition and what they are doing today. She describes such a responsibility as a massive honour to be presenting artistes of this caliber to audiences she had never seen before. One of the memories of this festival was the reunion of two Malian brothers – from the same mum and dad – who had hitherto not seen each other for a decade. Kasamadi, who was performing didn’t realise his brother, in Bala’s band, was watching. Realising that it would have been difficult for them to meet without this kind of festival given their different international schedules, they could only be grateful to Sona for inviting them unknowingly. “Kasamadi’s brother came to me crying to thank me for this opportunity to meet again,” she recalls. “I also performed with Abou Diarra, who is somebody that I have followed for so many years. He is an incredible talent. So for me it was breathtaking to perform with him because he invited me to join his show for us to do a duet together”. Sona closed the festival with an exclusive duet kora performance with her father, Sanjally Jobarteh, a master kora player, well acclaimed for his unique skills. Being the first time Sona and her father had performed a full length recital, it was a historic moment for both of them.“To be closing the festival with that was amazing. Again the impact on Polish audiences was great; the response was just another level,” she says. All in all, Brave Festival 2015 will surely go down in the archives of Sona. “So think it was a turning point in my career because it is something that is a hell of responsibility. The director as he said in the closing ceremony, “This festival has been a treat for me because this has been a time where I have just been able to step back and let somebody else do the work”. But as it was going, he was seeing and knowing it was working. I am always going to be grateful to him because he saw something in me that I was sort of not seeing,” Sona Jobarteh concludes.